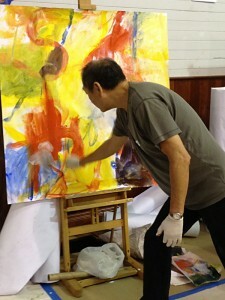 Clement Lee is an expressive abstract painter. Born in China, he grew up in Hong Kong, lived in Brazil and finally settled in the United States. His style of painting reflects his unique background with energetic, gestural brushstrokes of Chinese calligraphy, the warm colors of Brazil and the loose boldness of the American Abstract Expressionism. He and his wife now live in Pacific Northwest, in the beautiful city of Portland, Oregon.